The stability of the cellular genome is constantly threatened by a variety of exogenous and endogenous mutagenic agents such as UV light, reactive oxygen species, etc. Cells protect their genome against carcinogenic alterations by using a complex network of “caretaker” proteins that function to maintain the integrity of the cellular chromosomes. Inherited defects in these caretaker genes are the cause of genomic instability syndromes in humans, such as Fanconi Anemia or Bloom syndrome, characterized by a highly elevated risk to develop certain types of cancer. We study these diseases to understand and discover novel mechanisms important to control and suppress cancer susceptibility. My lab is particularly interested in the evolutionarily new Fanconi anemia (FA) caretaker pathway. According to the current FA pathway model (see cartoon), a large nuclear complex of at least 10 FA proteins is required to activate two downstream target proteins, FANCD2 and FANCI. This activation occurs in response to DNA damage but also during every S-phase of the cell cycle, when cells replicate their chromosomes. Thus, the FA pathway is suspected to have important functions to prevent DNA damage that occurs naturally during every round of chromosomal replication. 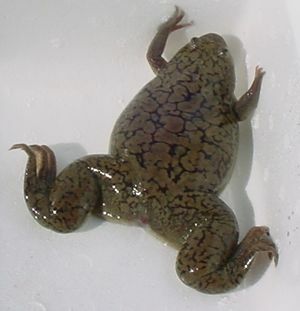 To identify the roles of FA proteins in the DNA damage response, we use egg extracts from the African clawed frog Xenopus laevis – an extremely powerful cell free system that uniquely mirrors cellular replication of DNA complete with the assembly of chromatin into a functional nucleus. The lab uses a combination of biochemistry, genetics, and imaging techniques to elucidate molecular mechanisms that underlie the FA caretaker functions, and to understand how FA proteins are networked with other caretaker proteins including the breast cancer-associated proteins (e.g. BRCA1 and BRCA2) and the Bloom syndrome-associated proteins (e.g. BLM and BLAP75). This page was last edited on 16 March 2009, at 12:28.